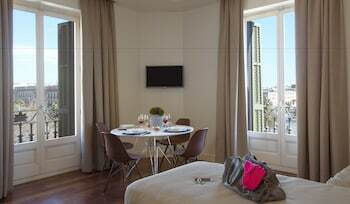 With a stay at Duquesa Suites, you'll be centrally located in Barcelona, just a 4-minute walk from Basilica de Santa Maria del Mar and 12 minutes by foot from Palau de la Musica Catalana. Featured amenities include limo/town car service, complimentary newspapers in the lobby, and dry cleaning/laundry services. A cruise ship terminal shuttle is available for a surcharge. A stay at Hostal La Rosa places you in the heart of Caceres, within a 15-minute walk of Gran Teatro de Cáceres and San Juan Church. Self parking (subject to charges) is available onsite. Located in Llanes, Picu Castiellu Aparthotel is in a rural location, within a 10-minute drive of Toro Beach and Puertu Chicu. Free self parking is available onsite.